The Divisional Secretary of Kuchcahve'li administrative division in the North of Trincomalee district has come under pressure—direct harassment as an informed civil source described it—from the SL Presidential Secretariat in Colombo this week. 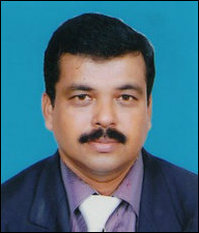 The harassment is meted out on Mr P Thaneswaran after he had questioned the legality of intruding Sinhala Buddhist monks, who fenced off a public bareland at Kumpu'rup-piddi East on 02 January. 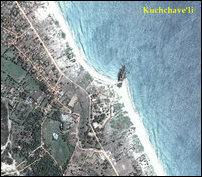 Kumpu'rup-piddi, a traditional coastal Tamil village with findings of pre-Christian pottery sites, probably from protohistoric period, has been subjected to systematic Sinhala Buddhicisation as well as corporate exploitation by the occupying Sinhala State, especially after the genocidal war on Vanni in 2009. 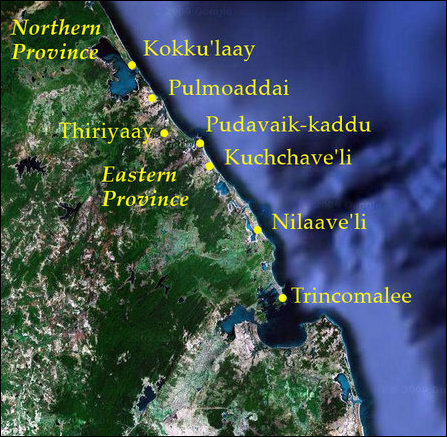 Kumpu'rup-piddi (Kumburuppiddy) is located 22 km north of Trincomale city along the Trinco-Pulmoaddai highway, between Chalappai-aa'ru and I'rakka'ndi bridges. A corporate outfit from the South, “The Kingdom of Raigam” has seized at least 1,800 acres of lands at Periya-karachchi near Kumpu'rup-piddi to ‘develop’ the largest saltern in the island at Kuchchave'li. Although the ‘development’ is claimed to be eco-friendly and infrastructure-development of the area, the entire project is Sinhalicisation, the people in the area complain. The corporate outfit has invested 500 million rupees into the project. The SL State, under Rajapaksa regime, took up the old Sinhalicisation agenda of Kuchchave'li “Tourism Development Zone” in 2012. Apart from the land grab by the SL Navy and the corporate land grab of Raigam, another corporate outfit with close links with former regime, launched "Jungle Beach Resort" claiming it as a eco-holiday resort in 2013. "It [The Jungle Beach Resort] claims to be eco-friendly, but it is certainly not people friendly. 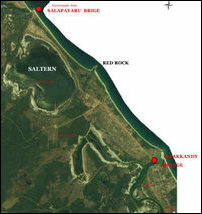 The local community not only hardly benefit at all from this resort but it was also built on their land,” said an article that appeared in groundviews.org website introducing the above STP publication. The local community not only hardly benefit from this resort, but it was also built on their land, the article further observed. However, the STP was also adopting an ‘orientalist’ perspective of reducing the nation of Eezham Tamils as an “ethnic minority” in their own country. 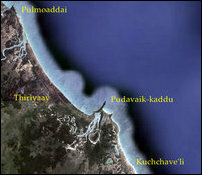 Kumpu'rup-piddi has been a Tamil area in its entirety. 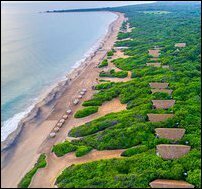 The “Jungle Beach Resort", built in 2013 at Kumpu'rup-piddi is owned by Uga Escapes Pvt Ltd, which is owned by one of the corporate conglomerate from the South, the Finco Group. Mr Thaneswaran is serving as the DS of Kuchchave'li Divisional Secretariat since May 2015. Before that, he was in charge of Verukal division, where he was also confronting the same dilemma, the sources further said. 14.01.18 Colombo prepares to seize entire hill-top of Maththa'la-mala..
13.04.10 Electioneering allowed in Kumpu'ruppiddi, Nawalapitiya re-po..
16.08.03 'Stop alienation of State land in Trincomalee district' - Sa..